Print your own Google Glass and look the partHan Solo, Honest Abe, and even Aristotle are just a few of the people who look absolutely fantastic wearing their Google Glass computers. But unless you’re a deep-pocketed developer from the US, chances are nil of getting anywhere near the audacious $1,500 spectacles. So why not do the next best thing and print a pair? 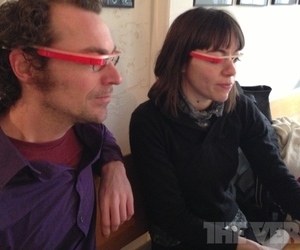 Google Glasses by joris – ThingiverseThingiverse is a universe of things. Download our files and build them with your lasercutter, 3D printer, or CNC. Google Glasses by cathy.tritschler – 3D WarehouseOne of the Best Inventions of the Year 2012 : Glass is, simply put, a computer built into the frame of a pair of glasses, and it’s the device that will make augmented reality part of our daily lives. With the half-inch (1.3 cm) display, which comes into focus when you look up and to the right, users will be able to take and share photos, video-chat, check appointments and access maps and the Web. Consumers should be able to buy Google Glass by 2014. Made for 3d challenge 163.